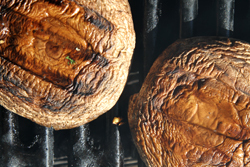 Portabella mushrooms are a hearty vegetable that loves the grill. 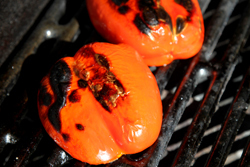 Add minced garlic and a splash of olive oil before grilling for exceptional flavor. 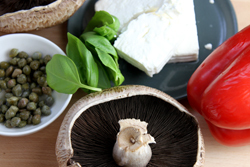 After grilling, stuff the mushrooms with a tangy mixture of feta, grilled red peppers, and briny capers. 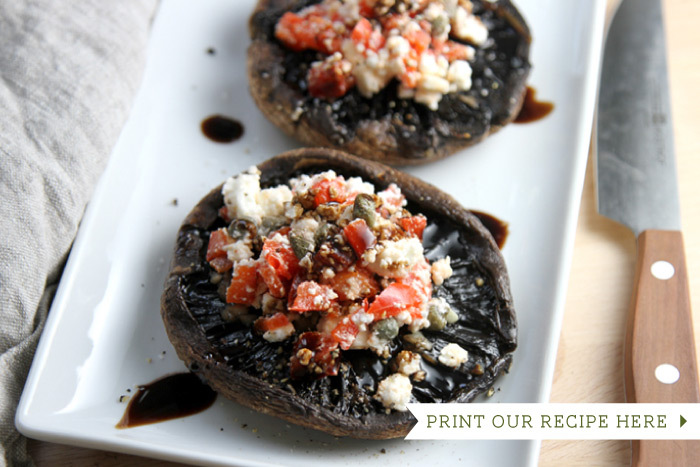 Serve these giant mushroom caps as a tasty main dish (great for vegetarians), or as a side dish for the mushroom lovers at the table. 1. Trim the stem off of the mushroom caps. 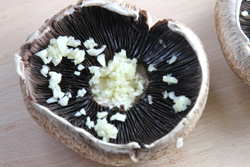 Mince the garlic, and sprinkle inside the caps. Drizzle with olive oil, sprinkle Kosher salt and freshly ground black pepper. Place the mushrooms on the grill with the gill side up. Grill over high heat for 4-5 minutes, turn and grill the other side for another 4-5 minutes, or until soften and tender. 2. 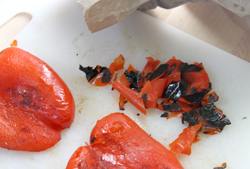 Cut the red pepper in half, and brush with olive oil. Sprinkle with Kosher salt and freshly ground black pepper. Grill for 3-5 minutes, or until softened. Place the pepper halves in a brown paper bag and close. Allow the pepper's heat to steam in the bag for about 4 minutes. Remove from the bag; the peel should be easy to remove at this point. Cut the pepper into a small dice. 3. 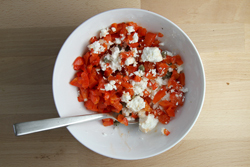 Prepare the stuffing by tossing the red pepper, feta, and capers together. Spoon the stuffing on top of the grilled mushroom and drizzle with balsamic vinegar and olive oil.